The RD3720 Series has been discontinued. Please see the RD45A & RD46A as a possible alternative or contact our Data Acquisition Engineering Department. The easy-to-operate OMEGA™ RD3721 and RD3722 flatbed pen recorders are sophisticated, high performance units which accept a wide range of input types. Features include a choice of measured data, bar graph or range data display modes. Versatile optional capabilities include GPIB or RS232C interface to handle data output and panel setting data,mathematical functions, remote controls, alarms, outputs up to four points and °F range data display. 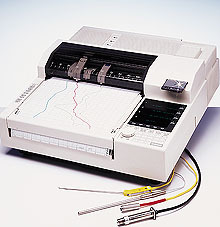 The RD3721 comes with an electronic pen lift and printer. The RD3722 comes with a manual pen lift. Both units provide high speed recording (1600 m/sec max), an auto span shift mode and partially expanded-scale recording, whereby any portion within full scale can be expanded or reduced for each pen. 참고: * Roll paper requires “-ROL” option on recorder. Comes with power cord, paper, 1 pen per channel, ribbon for printer version, an 8 K memory card for storing setup parameters only, plus complete operator's manual.